Shake It! Tug It! Throw It! Rough It! 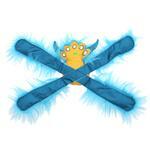 your dog will love the texture and fun with this Furry Horned Monsterpulls Dog Toy by Doggles in Teal! Bring out monster fun for your pet. They are ruff and tough, yet adorable and fun! The arms and legs are designed in an "x" and super stitched to form an excellent toy for pulling, shaking and general rough housing. This is great toy for multiple dogs! So round up the gang and get playing! Made of 4 layers of 1680 denier nylon(made from recycled water bottles) Inside stuffed with polyfill. Eyes and other decorations are embroidered. Made with Eco-Friendly material.